In the words of Anne with an ‘e,’ Jumping Jehosaphat! What a great time P.E.I. was! Adam and I just spent four great days with our good friends and island natives, Kara and Justin, exploring and touring the beautiful island. Having met Justin and Kara while completing my M.A. in Toronto, the four of us had many drunken conversations about Adam and I visiting the island and this summer we finally got out chance! Kara and Justin did a fantastic job touring us around the island, barely wincing at all the touristy things that I wanted to do including Green Gables, Cows ice cream, and of course, Lobster Supper! 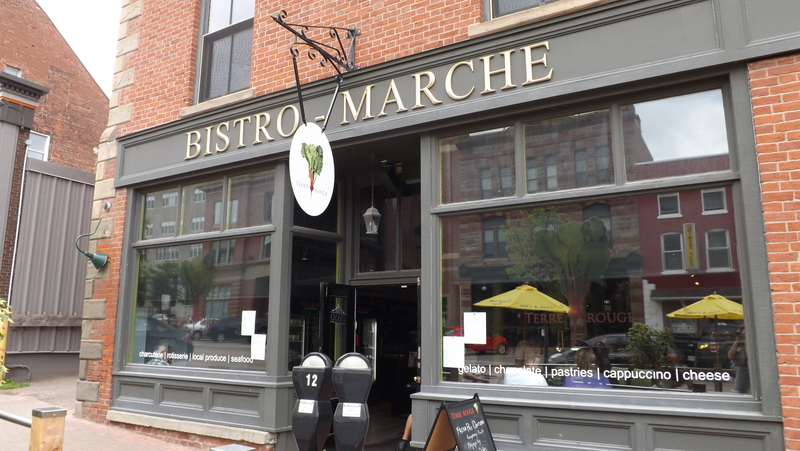 One of the culinary highlights of the trip was our visit to Terre Rouge Bistro Marche. Located in downtown Charlottetown on Queen Street, Terre Rouge opened up last fall and now serves up lunch, dinner, and a variety of market items including rotisserie chicken, artisanal cheeses, preserves, sausages, and even bread! 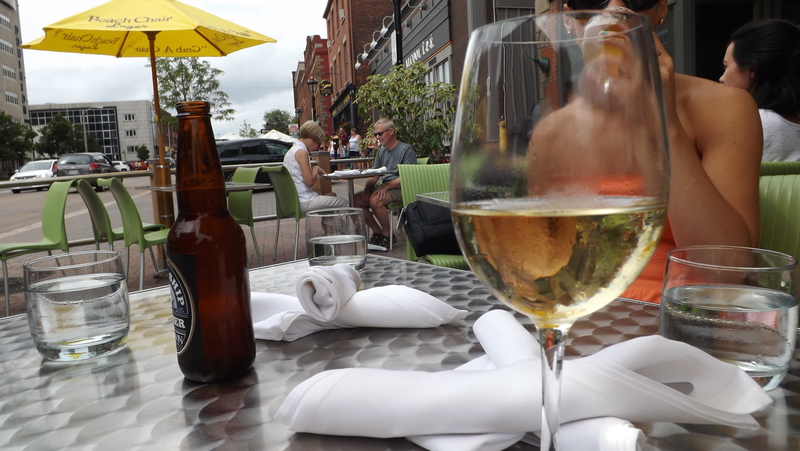 We arrived just after the busy lunch hour after our visit to Green Gables and chose to sit on the patio that is basically on the street. Even though it was a cloudy day, the patio was pretty much full, and I was impressed to see an oyster bar and a grill actually on the patio. I was really excited when I saw the menu. The food at Terre Rouge is bistro style with a focus on local produce. They use a lot of their own products and really emphasis the seasonal flavours of the island while making comfy recognizable menu items that appeal to the masses. Since it was lunch time, we all decided to forgo an appetizer and go for entrees. I selected one of the the house white wines, Vermentino Terret, to drink while everyone else went with beers. Adam chose a Tall Ship Amber from Garrison and Kara went with a Mill Street Organic, a favourite amongst all of us! The server informed us before we ordered that every day they change the Grilled Cheese, the Mac ‘n’ Cheese, and the Grilled TR Deck Sausage, altering the ingredients and spicing things up depending on what’s fresh, which is something that I love to see on a menu. I ordered the Mac ‘n’ Cheese which is made with TR (Terre Rouge) Aged Cheddar and buttered biscuit bread crumbs (say that three times fast, I dare you), and served with a ‘petite salade.’ I had the option to make my entree ‘de jour’ by adding broccoli, but I opted for the classic. When it comes to mac ‘n’ cheese, I’m a purist. It was de-li-cious. The cheese was so flavourful and just sharp enough to add another layer of flavour to this classic dish. I would have liked to see a bit more of the buttered biscuit topping, because really, can anyone get enough of that stuff? 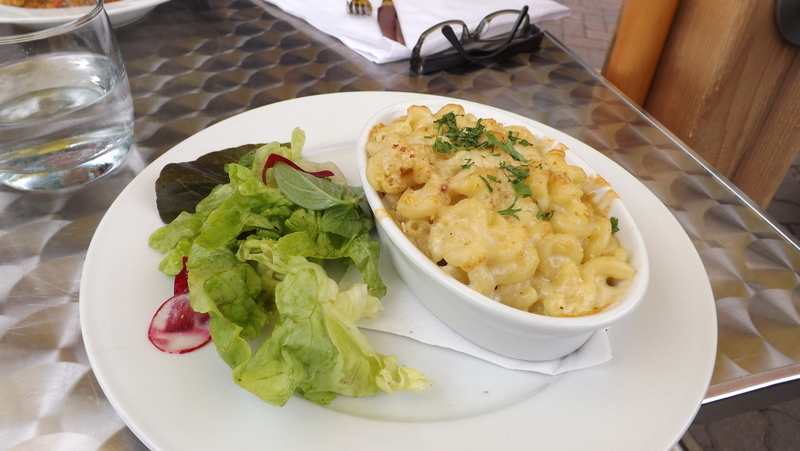 The salad that accompanied the mac ‘n’ cheese was also delicious and superbly simple. The dressing was light and complimented the local radishes, cucumbers and greens. I’m usually not a huge fan of radishes, but these were fresh and crisp and could convert any hater. Kara chose the Grilled Cheese immediately after hearing the server describe the entree. The large sandwich was topped with the daily feature cheese, the TR aged cheddar, and their very own apple and pear chutney. 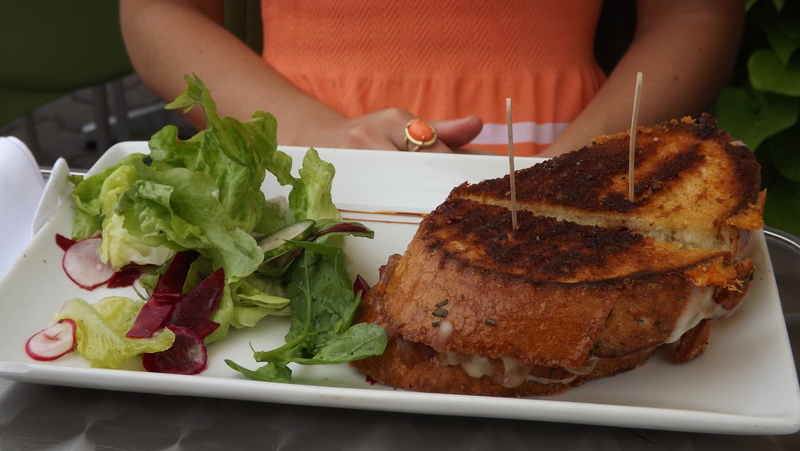 Kara loved the flavours and really enjoyed the Grilled Cheese, barely able to finish the large portion. She also enjoyed the salad and cleared her plate. Adam went with his typical go to, the Pulled Pork. 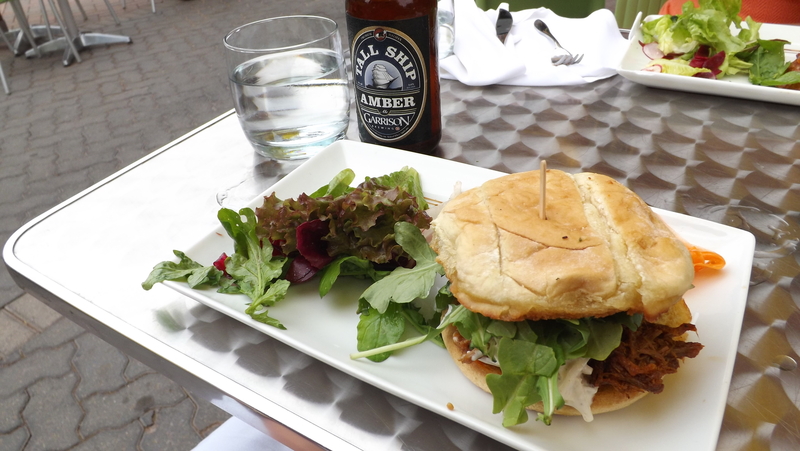 The Mango Bourbon Pulled Pork Sandwich was served with a heaping pile of apple fennel slaw atop the slow cooked pulled pork and served with a salad. Adam loved his entree, he thought that the slaw was amazing and really made the sandwich unique. 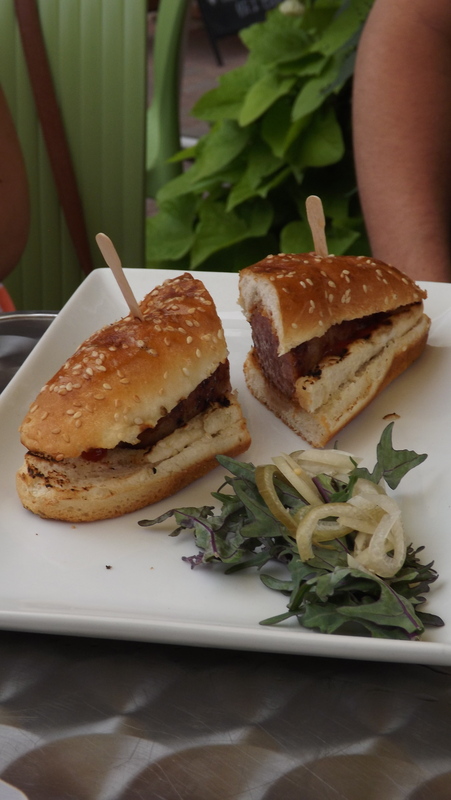 Justin opted for the Grilled Sausage of the day, which they actually prepare on the patio. There were seven different types of TR sausages to choose from that particular day and Justin chose the Bratwurst. One thing was a little odd about the service. When they brought out the food, there was a lag between our meals and Justin’s sausage. There seemed to be a disconnect between the grill on the patio where the sausage was cooked and the kitchen. Although it didn’t take long for Justin to get his sausage, it was a bit weird. Once he did get the sausage he really did enjoy; it was served on a lovely looking sesame seed bun with house condiments. To accompany his sausage, Justin also ordered the Fresh Island Vegetables. They were prepared like a ratatouille and a large portion came to the table in a big bowl. I tried some of the vegetables and they were yummy! The spices and preparation really enhanced the flavours of the fresh veggies. Overall our experience at Terre Rouge was awesome. The food was great, the drinks cold, and the patio was super pleasant and a great people watching spot. The only lacklustre part of the meal was the service; it lacked enthusiasm, like the server was already over the day by 2pm, which is when we arrived for lunch. That being said, Kara’s lovely mother suggested the restaurant to us, and I would recommend it to any local or visitor to the island. Terre Rouge uses fresh local ingredients to create delicious meals, awesome charcuterie, and take home goodies. I would love to go back in the fall and see how the menu changes for the season and Explore. Eat. Repeat. 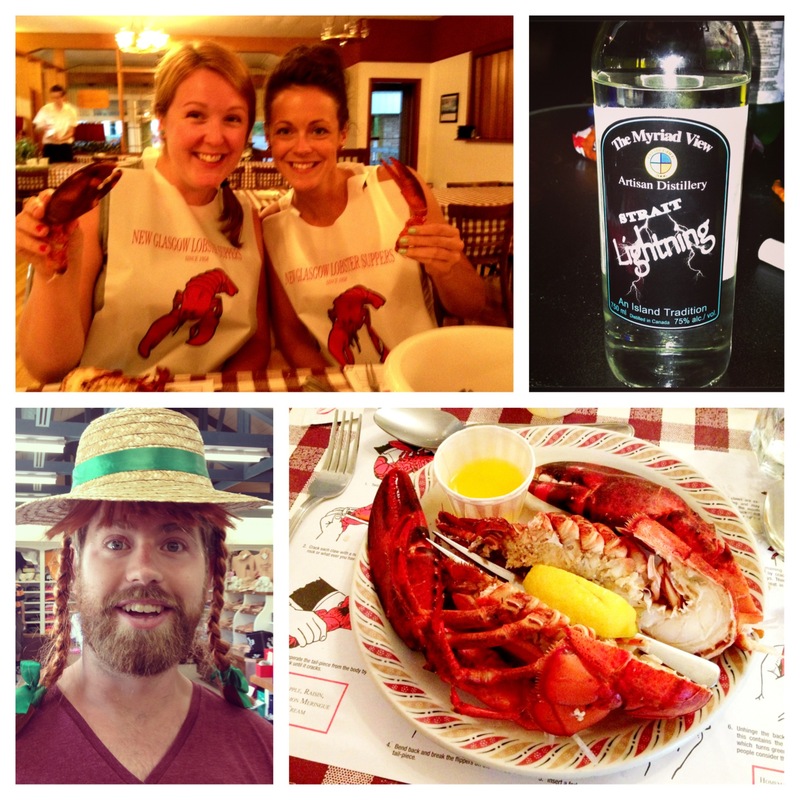 my way through Terre Rouge and P.E.I, YUM! Cost: About 45$ plus tip, which is very reasonable for lunch and drinks for two people. The entrees only ran between 10-16$, though I’m sure dinner is more. Things I liked: The side salads and the patio oyster bar. Things I didn’t: The service. Best place to sit: By the window for an intimate date night, or on the patio for some serious people watching. What to order next time: Local charcuterie and cheese, and DESSERT.